Best part: Hesterman takes a systems approach that not only looks at the environment, health and agricultural issues across the food system, but includes social issues such as access to nutritious food and treatment of workers on farm fields (in the U.S. and around the world) and in restaurants. Small disappointment: Hesterman does not provide the answer. In its place, he provides hundreds of examples of innovative, mostly small-scale programs that are beginning to tackle pieces of the issues. While I understand that we don’t have an answer as to how to feed 9 billion people with local, sustainable foods, I still wanted more number crunching and gap analysis at the system level. Impossible, I know, but the title of the book led me to believe he might have the answer. However, his suggestions at the end come close to meeting this expectation – he suggests ways for everyone to be involved in creating a fair food system that ranges from ‘voting with your dollar’ to community initiatives to institutional changes. And it includes ideas and solutions that include those living in poverty. BECAUSE HEALTHY FOOD IS NOT A LUXURY. The premium pries at farmers markets and for organic food in the grocery stores means that it is simply not an option for a huge part of our population. They are not able to shop at their nearby Whole Foods, because Whole Foods doesn’t even exist in their neighbourhood. So Hesterman also looks at large-scale farming solutions and the role of large corporate retailers in ensuring fair practices exist across their supply chain, and community gardens in under-served neighbourhoods. Neighbourhoods like the entire city of Detroit, which does not actually have any chain grocery stores left in the city limits because it is not financially beneficial. He talks about programs that double the value of food stamps for purchases made on produce at farmers markets, and the huge increase in spending that occurred because of this offer. And he argues, quite reasonably, that we need to keep the current principles that guide the current system: efficiency, high crop yields, and convenience. BUT, the book then focuses on adding four other principles to balance these: equity, diversity, ecological integrity, and economic viability. So, in short. 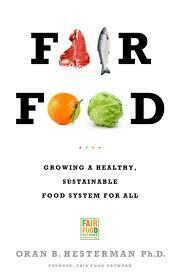 If you are interested in a more holistic picture of the issues in the existing food system and the solutions that might help, read this book. And to Oran Hesterman, thank you for writing a book that did not give me the answer I was looking for.